Charlene Choi Cheuk Yin, Michelle Wai Sze Nga, Tsui Tin Yau and Wong Yau Nam yesterday attended the film JOI GEIN UFO (SEE YOU UFO)'s production start ceremony outside the Space Museum in Tsim Sha Tsui. Ah Sa's cohort Gillian Chung Yun Tung earlier wed the "medical world god" Michael Lai in the U.S. Ah Sa not only congratulated them but also received the bouquet from Ah Gil directly. However she said that she would let marriage take its natural course. She even revealed that back then she and Ah Gil wanted to go to Bermuda together. She believed that now Mrs. Lai would make that happen and would not leave her behind. Earlier going to Los Angeles to attend Ah Gil's wedding party, Ah Sa revealed that after returning to Hong Kong she immediately began work on the film. Although the jet lag has been severe, yesterday she worked on the scene in which she bombed her job interview at the Space Museum. Thus she could be out of it and did not need to be too alert. Ah Sa said that when she was little she loved to go to the Space Museum shows, but she has not been back in over a decade. This time the story revolved around UFO. She, Tin Yau and Yau Nam saw an UFO but no one believed them. 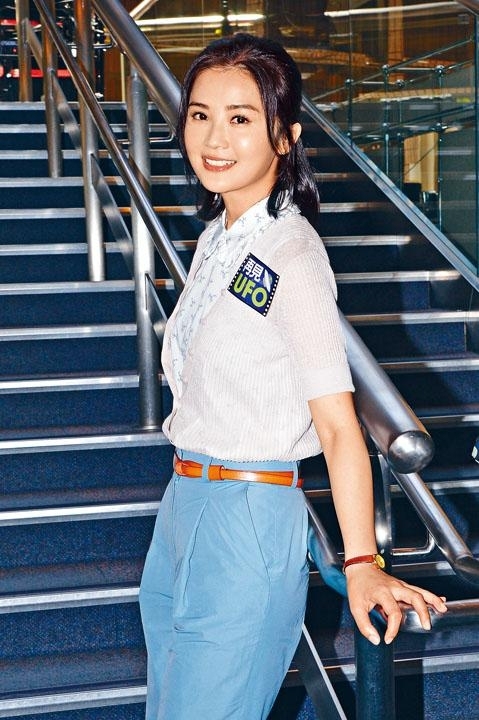 Ah Sa said, "Ha Siu Sing (Donny Summer) always talks about UFO. I believe in the existence of UFO. I want to see it, I wouldn't be afraid. I really like to see stuff that is related to history, like the Pyramid, the Colosseum and Machu Picchu, Peru,. However I haven't been to Egypt. Earlier Ah Gil and I wanted to go to Bermuda together." Ah Gil now had to keep her husband company, so she probably would not be able to go with her? Ah Sa said that Ah Gil was not like that. Reporters suggested for her to go there for her honeymoon. She said, "I will worry about it then!" Ah Sa also said that everyone thought that from all the movies she had to make this, she must be very hard working. Actually she wanted to finish them sooner so she could relax more in the second half of the year. Ah Gil handed her the bouquet at the wedding party. Did she want her to wed soon? Ah Sa said that it was just for good luck, she would let it take its natural course. She also said that looking back she felt strange, because Joey Yung Cho Yi was holding her from behind while Yumiko Cheng Hei Yi stared at her from afar like she was being held captive. The process was truly very touching. She also revealed that Ah Gil was still in the U.S. In order to attend Ah Gil's wedding party, Ah Sa was unable to celebrate her boyfriend's birthday with him. How would she make it up to him? She revealed that she would have dinner with him. She already gave him a present. She boasted, "We get it." Tin Yau and Yau Nam said that 16 years after SUMMER BREEZE OF LOVE (JEH GOR HA TIN YAU YI SING), they worked with Ah Sa again on a film. In it they played friends. Tin Yau said that in the film he and Sze Nga would have a romance. He thought that there would be no intimate scene. Since the film was about 80's nostalgia he thought it would be a little more innocent. Later the director told him that there would be a passionate scene. Sze Nga said that at first she thought that it would only be a kiss, but the director told her it would be "a little more". With her experience, that meant that there would be a lot of room for imagination. The few words in the script meant the more extreme it would be. Tin Yau joked, "The director even asked me if I asked a trainer to work out, like I would have to take off my clothes at any moment." Yau Nam revealed that he had to lose weight for his ailing character. The director that he could drop back to his GALLANTS (DA LUI TOI)'s 115 pounds, but that would be impossible. He said, "To lose weight I haven't eaten in two days, I just had black coffee. I had 3 or 4 cups a day. Now there is 'out not in'. I had stomach pain." Tin Yau also felt bad for Yau Nam. "I thought I was bad with just broccoli, he didn't get to eat at all. If I had to return to how thin I was when I started, I thought I would need computer graphics!" In a strap dress, Sze Nga said that she felt tough seeing the blazing sun outside. Luckily most of her scenes would be shot at night.